A whistle is a simple device that produces sound when air is forced through an opening. Their loud, attention-getting blast makes whistles essential for police officers and sports referees. They can save lives when used by lifeguards, lost campers, or crime victims. Innumerable organizers and leaders, ranging from teachers to drum majors, use them to focus attention and demonstrate authority. In addition to those blown by humans, mechanically operated whistles serve many purposes. For example, a form of whistle can measure the rate of flow of a fluid in a manufacturing process and even control fluid flow. Whistles can signal the escape of some sort of gas, the ordinary tea kettle being the simplest example. Whistles that are activated when a filter becomes clogged have been designed for a variety of devices including home furnaces, automobile catalytic converters, and hair dryers. Complex aerodynamics are involved in the operation of a whistle. In the familiar design known as the American police whistle, air blown through the mouthpiece travels down a rectangular tube until it encounters a slot at the top of the whistle. The far edge of the slot slices the airflow into two parts. The top portion is deflected upward in curls like rind being peeled off a fruit, forming swirling vortexes of air. This whirling stream causes vibrations in the air above the slot, generating sound waves. The lower portion of the inflowing air is deflected downward into the barrel-shaped chamber of the whistle, where it swirls around the curved wall until it once again reaches the top. It then pushes up through the slot and reinforces the vibrations being caused by the whirling upper layer of the airstream. Such a whistle does not need a ball in the chamber to produce an effective sound. However, if a ball is present, it too swirls around inside the chamber, alternately blocking and unblocking part of the exit slot. This action produces a warbling alternation of tone that makes the whistle's sound more attention grabbing. So-called "pea-less" whistles operate without the presence of a ball in the chamber. Often, they use a combination of chamber shapes to produce multiple tones that make the whistle's sound more audible above other noises such as cheering crowds or howling wind. One such whistle is designed so that the different tones are produced out of phase with one another, alternately canceling and reinforcing each other, to produce a trilling effect. Various manufacturers claim to produce the "world's loudest whistle." Objective loudness is based on a decibel rating, which can be measured for each whistle; the loudest ones produce sound of about 120 decibels. Subjective evaluations of loudness reflect the fact that certain pitches of sound seem to be louder than others even at the same decibel level. Thus, in a noisy indoor arena a higher-pitched whistle might appear to be louder than a lower-pitched whistle that has a slightly higher decibel rating. Whistles made of bone or wood have been used for thousands of years for spiritual, practical, and entertainment purposes. One of the most distinctive whistles is the boatswain's pipe used aboard naval vessels to issue commands and salute dignitaries. It has evolved from pipes used in ancient Greece and Rome to keep the stroke of galley slaves. A medieval version was used during the Crusades to assemble English crossbow men on deck for an attack. The model currently being produced by the Acme Whistle Company of Birmingham, England, was first manufactured in 1868 by the company's founder, Joseph Hudson. The modern era of whistle use began in 1878 when a whistle was first blown by a referee during a sporting event. Hudson, a toolmaker who was fascinated with whistles, fashioned a brass instrument that was used in a match at the Nottingham Forest Soccer Club. This device was found to be superior to the usual referee's signal of waving a handkerchief. In 1883, the London police force made it known that it was seeking an alternative noisemaker to replace the heavy, cumbersome hand rattle the officers had been using. Hudson invented a light, compact whistle that produced two discordant tones that could be heard for more than a mile. It was immediately adopted and the same design is still in use today. The following year, Hudson invented the "pea whistle." Movement of a small ball enclosed in the whistle's air chamber produces the familiar trilling effect now commonly associated with American police and referee whistles. The pea whistle remains the world's largest-selling type. Manufactured whistles are made of either metal or plastic. The only metal whistles manufactured in the United States are made of brass (an alloy of copper and zinc); the fact that they are nickel or chrome plated gives rise to a common misconception that they are made of steel. Brass is used because of the same tone and resonance qualities that make it effective in musical instruments. Because brass is a relatively expensive metal, these whistles sell for about $3. Because metal whistles are hard and subject to temperature fluctuations in very hot or cold weather, rubber mouthpieces are manufactured as an optional accessory. Besides providing a cushioned mouth grip and a reliably comfortable temperature, the accessory also provides a mechanism for adding color to the metal whistle. Sheets of brass are unrolled from supply reels and fed into stamping machines. 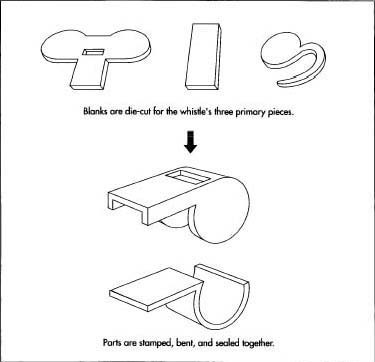 Blanks are die-cut for the whistle's three primary pieces: the rectangular air-input tube, the barrel-shaped chamber, and a fitting for the back of the whistle that will hold a ring to which the user can attach a lanyard (cord). Different grades (hardnesses) of brass are used for the two main functional pieces of the whistle. The pieces pass through a series of stamping dies and presses that perform a progression of cutting and bending operations to form them into the required shapes. The company name (or a customer's custom logo) is stamped onto what will become the top of the whistle. Pea whistle blanks are die-cut for the whistle's three primary pieces: the rectangular air-input tube, the barrel-shaped chamber, and a fitting for the back of the whistle that will hold a ring to which the user can attach a lanyard (cord). while solder is applied to the joints and the assembly is heated, sealing the parts together. Each whistle is mounted in another machine, where a vibratory sander smooths the exterior surface to a pre-plate finish. A nickel or chrome plating is applied to the exterior of the whistle. The cork ball is inserted in the whistle. A machine compresses the cork and shoots it through the slot on top of the whistle. Once inside, the cork returns to its original shape, making it too large to fall out through the slot. A metal lanyard ring is inserted into the holder on the back of the whistle. Standard whistles are packaged in a plastic bubble attached to a cardboard backing. More expensive versions, suitable for use as gifts or awards, are mounted in a plastic box or a wooden case. With the exception of cosmetic touches like a gold-plated, rose-engraved, cubic zirconia-studded safety whistle for a loved one, the metal whistles manufactured by the American Whistle Corporation have not changed substantially in the past 40 years. Similarly, the Acme Whistle Company's European-style tubular, pea-less police whistle is the same model it has been producing for more than 100 years. The designs are classic. The cork ball is inserted in the whistle. Once inside, the cork returns to its original shape, making it too large to fall out through the slot. When air and the cork ball collide, it produces the familiar trilling effect. manufacture and market a whistle invented by Howard Wright, an American dentist; this unusual whistle is designed to work even under water. U.S. patent applications reveal ingenious adaptations of whistles for a mind-boggling array of applications. Some are developed to meet serious needs, like a device that sounds an alarm tone when there is an insufficient flow of gas in an anaesthetic apparatus. Some serve a practical purpose of less-compelling importance, like a sensor that whistles when a piece of meat has been cooked to the desired doneness. Some are purely entertaining, like a frozen confection with an embedded whistle. And some are multipurpose, like the instant-cooling apparatus for a beverage can that not only chills the contents when activated but also expels a colorful gas while emitting an amusing whistling sound. Chanaud, Robert C. "Aerodynamic Whistles." Scientific American (January 1970): 40-46. Meeks, Fleming. "Whistle Blower." Forbes (April 12, 1993): 104-105. American Whistle Corporation. http://www.americanwhistle.com (March 20, 1998). "The Fox 40 Pea-less Whistle Story." Fox 40 International Inc. http://www.fox40whistle.comlaboutl.htm (March 2, 1998). "Safety Whistles." All Weather Whistle Company. http://www.9am.com/whistles/index.html (March 25, 1998). "A Whistle Stop Tour Through More Than 125 Years of Sound Development." Acme Whistle Company. http://www.webxpress.co.uk/acme/history.html (March 25, 1998).